Do you find it difficult to stay focused long enough to complete big projects? Do you feel like you’re constantly being pulled in different directions, or worse, pulled down a social media rabbit hole? 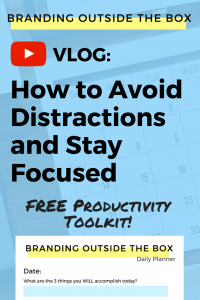 In today’s video, I’m sharing my top tips for staying avoiding distractions and staying focused. 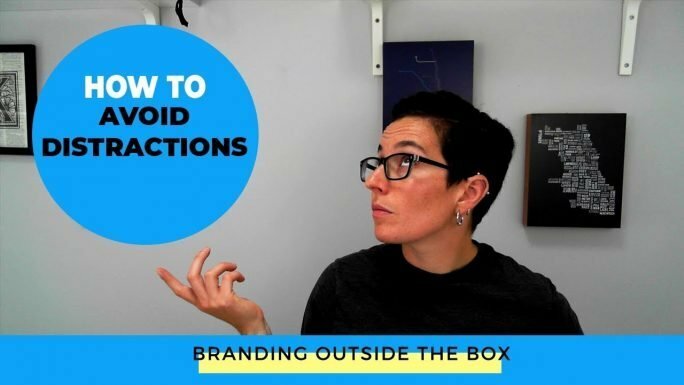 My name is Dana Kaye and welcome to my channel, Branding Outside the Box, where I help driven entrepreneurs and aspiring leaders become more memorable and make more meaningful connections. Becoming more memorable and making more meaningful connections takes time and focus, and that’s why today I’m sharing ways you can stay focused and avoid distractions. The best way to stay focused is to create structure. As entrepreneurs, we often work from home and have more control over our schedule. This can be a double edge sword, because too much flexibility can often lead to distractibility. I schedule out my day using a Panda Planner. This helps me identify major projects, list out small tasks, and see my daily schedule. By sticking to the tasks and projects in my planner, I can avoid jumping on a project that isn’t that important or getting sucked into time wasting activities. The more you’re able to add structure and routine into your day, the better you’re able to focus and the easier it is to avoid distractions. The second tactic is to disable all notifications, both on your phone and computer. I addressed the importance of this my last video, but it bears repeating. Bing-bongs on your phone, dings on your desktop, and pop ups on your browser are all designed to disrupt. Whatever you’re doing is immediately put on hold to tend to the alert, and that often leads to further time wasters. Don’t let your phone dictate what you do. Finally, avoid task-switching. Every time you move from one task to another, it takes at least 20-40 seconds to reset and re-focus. The more often you switch from task to task, the more time is lost. In a recent study from the American Psychological Association, even these brief moments can eat up 40% of an individual’s productive time. That’s time that could be spent working towards your goals. Instead of having multiple tabs open and working on several projects at once, tackle them one at a time. If you need some guidance on increasing your productivity, I encourage you to claim your free Productivity Toolkit. This includes resources for spending less time in your inbox and managing your calendar, as well as daily and weekly planner sheets that will help you add more structure to your day. Great video- I am very bad at task switching. This video is a great reminder for me that I need to stop that!